At first sight, the name of Traumkraft will tell you absolutely nothing! But if we look at it closer, we see Wolfgang Barkowski's name (Alien Nature) attached to this project. And when we see Wolfgang Barkowski's name, we know for sure that the project will be highly interesting. “Seelenwanderer” (Wandering soul) is the 2nd opus of the duet which also includes the German musician native of Herdecke Marc Iwaszkiewicz, a spiritual master who specializes in gongs and percussions of the world as well as in esoteric reverberations; 3 main elements which forge the atmospheres and the tribal rhythms of “Seelenwanderer”. Discreet but how much effective, Wolfgang Barkowski supports this album with a sequencer which mixes skillfully its beats to the various clanic percussions and with some very sibylline effects of synth and of which the gloves of black velvet wrap up the ambiences and the essences of this 2nd collaboration between the latter and Marc Iwaszkiewicz. 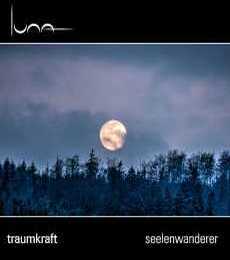 A first album, Traumzeit, passed under the radars at the end of 2011 and this time the division Luna of the German label SynGate sees that “Seelenwanderer” will receive all the attention which it deserves. A distant buzz gets tie up to our ear lobe, introducing the fascinating inter continents journey of “Seelenwanderer”. This drone line shakes some spasms, creating the first illusion of rhythm of "Nachtstaub Intro". A meshing of percussions and pulsations gets graft to this structure ambiosonic which is finely jerky, forging a rhythm as linear as a test of cardiac arrhythmia which will lead us to the very dark and glaucous ambient passage of "Zwischenspiel I". It's "Tag der Spinnen" which will seduce in very first our ears. On very restful layers of violins and the ambient airs of a very ethereal flute, the music pounds delicately with percussions of any kinds and a line of bass sequences which makes roll its palpitations in perfect anaesthetising cycles. And if we are not convinced yet of what we have between ears, "Der Gesang der Steine" shows it to us for good with a long ambiospherical structure where drones, flutes, percussions and effects weave these clanic sound panoramas that Steve Roach developed in his famous Dreamtime Return phase. “Seelenwanderer” is an album of ambient tribal music with some very blazing effects of reverberations which glitters of the music of the five, or seven it's according to, continents. In a long fresco of 68 minutes, where every title is very solidly connected from each other, the duet visits the rhythms and the ambiences of India with "Schattenspiel" and its notes of Sitar blocked in the turbulence of winds and percussions, of Asia with the quiet "Tropfsteine" and its beautiful fluty lullaby, of the peoples of Australia with the much ambient "Der Schwarm" which also suggests a beautiful electronic Berlin mood approach, as well as the landscapes of ices from the deserts of coldness with "Folge dem Ruf" and its very acute effects of reverberations. Between these phases, “Seelenwanderer” proposes some nice moments of meditative serenity, like the saga of Zwischenspiel, and also offers us a superb ambiospheric and ambiosonic passage with beautiful titles like "Elysium", "Wandernde Seelen", "Höhlentraum" and "Zwischenspiel IV" which lead us to the finale of “Seelenwanderer” where "Nachtstaub Outro" loops the loop with an end which refuses to die. Traumkraft signs here a very beautiful album in “Seelenwanderer”. An album which depicts in all correctness the meaning of its title where we imagine easily a hermit doing a road trip around the world in music. Here, the ambient music and the music of ambiences unify borders in a very beautiful mosaic of tribal elements brought together from the 4 corners of the globe. Marc Iwaszkiewicz is rather impressive in the choice of his percussions and in the inspirations which emanate from his reverberations. But we should not forget Wolfgang Barkowski's inspiring play which adds a very beautiful depth at the level of the intrusive rhythms and ambiences which take at times a tint of unrealism. A very beautiful album which actually has to receive all the attention which it deserves. 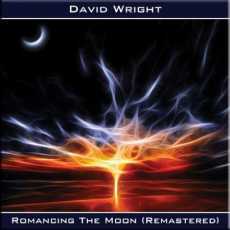 “Romancing the Moon” is the 4th album that David Wright remixes and remasterises for the needs of iTunes and of Spotify as well as for the love and needs of his fans. Offered in a manufactured CD and in digital download, the sound remains as charming and authentic as on Reflections. We also sense here that David Wright appends quietly his claw on the scene of the English EM by inspiring it a melodious approach tinted with romanticism. And a little as on his first album, the English musician proposes a collection of nine titles filled with very poignant orchestral arrangements and with nostalgic melodious lines which constantly come to upset our feelings. Moreover if we do not sigh on the tears of very beautiful title-track, it's maybe because we have the spirits somewhere else. But before we dance the eyes in the stars with "Monnmaiden" which is a kind of cosmic Rumba made up of David Wright's most beautiful musical assets. The rhythm is lascivious with lines of harmonies which subdivide their airs in a more relaxing than lively approach. That sounds like the harmonies of the MIDI of the 80's. "Romancing the Moon" is a beautiful moment of tenderness that only David Wright (and Vangelis) is capable of offering. Layers of mists filled of iridescent particles, layers of weeping violins and breaths of absent voices caress a slow march towards the heavens putting in music by a keyboard with chords of an acoustic guitar and especially very romantic. Quiet and very wrapping! It's only after some listenings that we shall fall under the charms of "Moonlit Dream". Its slow introduction is flooded of seraphic voices among which the celestial harmonies, as well as the discreet songs of panpipes, converge on a delicate ambiospherical ascent. The keyboard keys swirl as a worn carousel, wrapped up that they are by dense and luxuriant arrangements. A completely unexpected line of bass sequences shakes these soporific atmospheres a little after the bar of 5 minutes. The rhythm becomes intensely pulsatory and beats a completely excessiveness pace with a kind of spirals oscillators which go and come in minimalists loops a la Philip Glass, as running breathless to lose pace. A rather distant melody grafts its arpeggios a bit fluty which sparkle in a thick mosaic of synthesized mist. Altering a little its harmonious pattern, "Moonlit Dream" melts in a 3rd phase at around the 10th minute. The melody becomes then more concrete while the banks of mist intensify their poignant caresses. It's a very good title of the Wright catalog. "Twilight Rider" is a good and very lively electronic rock with great effects of cello, or a Patrick O' Hearn bass line style, which stretches its lamentations in a completely mesmerizing way. If the rhythm is solid, the harmonies are note outdone by arpeggios which ring like a mixture of panpipes and xylophone in momentum of seraphic voices. More melancholic, "Cry of Autumn" flows like a continuation of thoughts lost in our ocean Memory. David Wright spreads a painting as melodious than nostalgic where teams up his breathes of Pan and the arpeggios which ring with indiscipline. And always these caresses of mist which wrap up all the seraphic movements of “Romancing the Moon”. And I like this small bucolic melody which strolls around in the background of this musical adornment and which glitters in solo here and there. We are in the best of David Wright here. From a music piece loaded of tenderness to a solid electronic rock, the English musician handles both brilliantly on his 2nd album. "Moonlight Express" chases away the melancholy of "Cry of Autumn" with a structure of spasmodic rhythm where a kind of train hiccups with a line of sequences which makes skip its keys like imps pressed to play their dirty tricks. The percussions bludgeon this structure of electronic rhythm with the precision of the rowers of the antiquity, creating a perfect rhythmic cradle for these delicate harmonies blown by a synth always in its mode of elegiac flute. "3 Past Midnight" brings us back the melancholy of “Romancing the Moon” with a soft night and morphic ballad which justifies its title. On a line of spasmodic rhythm a la Chariots of Fire from Vangelis, "Tunnel Vision" lie down a great melody weaver of earworm with a beautiful line fed of violins which sing like the keen current of a brook under the gilts of the sun. We hear even there the reflections of the other arpeggios to sparkle. "Full of Eastern Promise" ended “Romancing the Moon” at that time with a beautiful duel between percussions, bass pulsations and series of sequences among which 2 which bicker a melodious approach full with fragrances of the East. And if you have read this review from beginning to end, you doubtless understood that this album is a wonderful one that David Wright redoes with 2 bonus tracks. Composed in 1998, "Dancing Under Moonlight" proposes an introduction full of the essences of "Full of Eastern Promise" before rerouting its ambiences towards a good up-tempo whose the hopping rhythm always remains caressed by these seraphic mists. A beautiful minimalist melody decorates the static flow of the rhythm, even that a more changeable 2nd one sparkles such as a rivulet of pearled sequences. Written with Dave Massey, and 7 years later, "Timeloop" is even more lively, it's almost a techno, than "Dancing Under Moonlight" It's a kind of hymn to life, because of its very beautiful arrangements, that expresses itself rather easily on a dance floor. And the dance music of David Wright always has this little something of special which makes that we are a little hampered to say that it is humdrum. But no matter, “Romancing the Moon” remains a wonderful album where the abundance of arrangements can annoy those who like to badmouth on the back of this likeable English musician. I found no faults there! It's very melodious with some very good sequencing pattern. And if we place this album in its time frame, in its context it's not false to claim that it's a major work in David Wright's catalog. And this remasterised version is amply worth its reason to be, because I discovered it again and even more in-depth this really excellent album of David Wright. 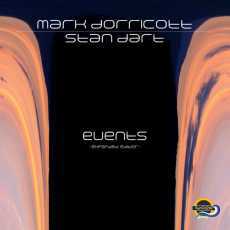 Before Midnight, the duet Mark Dorricott and Stan Dart had made a first album entitled “Events”. Realized in 2013 on an independent label, the album received a good welcome of the criticism and of the public with its skillful mixture of the jazzy approach of Mark Dorricott to Electronica of the Australian musician. Following to the success of Midnight, the division Wave of the SynGate label gives a bigger visibility to this work where Stan Dart made the first mixes and remixes of the English musician compositions. We are far from Berlin School? Totally! But you should not close your ears too fast for all that. According to the rules of Midnight, “Events” is an album where the Chill Out and the ambient Dub spread its melancholic movie approaches in the fragrances of a synth-pop or a dance music of the 80's. The music is beautiful, the arrangements seduce and the piano of Mark Dorricott never stop charming. In brief, a beautiful album which hatches beneath all the atmospheres. A little as an agitator of consciousness, "Reflections (Midnight Mix)" begins the discovery of “Events” with a good up-tempo which takes the looks of the dance music of the 80's. The rhythm is nervous and is coupled to a delicate melody strummed by the agile fingers of Mark Dorricott. A sweet mixture of synth-pop and dance, a little as in the years of Bronski Beat or still Frankie Goes to Hollywood, but with more musicality and a more jazzy orientation. Although.... Stan Dart is doing a colossal work at the level of the arrangements and neglects no detail to give a sort of Night Club dimension to the music of “Events”. The ambiences which surround "In a Silent Way (City Lights Mix)" prove it even more with an approach a bit techno which does not succeed in taming the structure of jazz which gets free of the title. It's lively. We bang of the forehead and our feet want to reawaken. Except that at the time of writing these lines, I was not convinced yet. It's completely different with "Time Slides (New Version)" which is a title rather poignant with its semi-slow structure where the piano melody of Mark Dorricott turns our emotions upside down. The structure is intense and intrusive, like the proceedings of a hyper dramatic scene at cinema. And it's without a doubt the center of interest of the music of this eclectic duet; the very cinematographic approach! And “Events”, and Midnight, which roll like the sound track of a movie that we shoot in our head. The very beautiful "Twinkling Away (Classic Ambient Mix)" is a great moment of tenderness which has its place in a hyper melancholic movie. The piano is very pensive and the violin tears are very enveloping. We drag this title for an evening of romance, the same goes for the nostalgic and the rather lascivious Chill Out of "Event Horizon (New Ambient Version)". If we like, "In Between the Lines (Chillout Mix)" is a little bit in the same style, but with a little more lively structure. "Time to Remember (Club Mix)" and "The Eye (Single Mix)", a composition of Mark Dorricott and Stan Dart, is in the same style than "Reflections (Midnight Mix)" (samplings of voices in plus) while "What Lies Beneath (Ambient Version)" and its very Blade Runner vision is the most ambiospherical track in “Events”. "Reflections (The Other Mix)" is heavier, slow and more lascivious on the other hand. The album includes 3 versions of "The Eye". The 3rd offer a more mysterious cachet in its envelope of gloomy movies from the era where the dark heroes were so popular. Even if it is not really my cup of tea, I surprised myself appreciating many passages of this “Events”. I heard ambiences of dark movies and especially the signs of Midnight and its very particular vision of Blade Runner. Flooded in good arrangements and buried by rhythms of dances as ambient as attractive, the piano of Mark Dorricott shines with a clearly more efficiency here than in solo. And without the adornment enhanced by the airs of this piano and Stan Dart's very filmic vision, “Events” would be an album of Chill Out, of Dub or Lounge as it is made by tens. The reedition of David Wright's catalogue continues. David Wright is the man behind AD Music, Code Indigo and Callisto as well as other collaborations with Robert Fox, Ian Boddy and Klaus Hoffmann-Hoock. Synonymic names of electronic music of high quality where melodies prevail over ambiences and electronic rhythms in orchestral arrangements deserving of Vangelis' big works. It's to Klaus D. Mueller, manager of Klaus Schulze, that we owe the discovery and the hatching of this brilliant composer and English arranger who was going to put his seal on the scene of the England School. The adventure begins in 1989 when David Wright produced his first cassette, “Reflections”. Impressed, Mueller will distribute it, as well as his following albums under the label POEM. And this until 1994, the year of the label AD Music foundation. In 2001, AD Music gives a second breath to “Reflections” with a new digitally restored edition in a CD-r format. This last edition of “Reflections” is digitally remastered in 24 bits from original sources and pressed in manufactured CD. Besides a small wall of notes on the artwork, this new edition includes 3 new titles composed between 1996 and 2015. Drum beats, jingles and a powerful bass line cut out in lively and jerky pulsations open “Reflections” with strength. "Don't Look Back" is a strong source of motivation to pursue the exploration of this David Wright's first opus. The synth covers this rhythm of electronic rock with a delicate melody whistled as a walker who contemplates the luxuriant greenery under a radiant sun. Other percussions add as much weight as swiftness to this hymn of electronic rock which will be the only one of David Wright's repertoire. "Don't Look Back" is a dynamic title which answers to a need at that time if we recall Christian Richet's Overture. "Don't Look Back" starts as a kicker, the rest of “Reflections” is just like that we know of David Wright; a superb melodist who gives life to meditative airs onto structures as much dreamlike as relaxing. "Romance" is a long seraphic title with beautiful arrangements where the synths have the looks of a string quartet. The first part is acoustically soft with a surrounding cloud of Mellotron mist. This very beautiful piece of music with the airs of film theme goes straight into the fibers of our soul with a beautiful ambiospheric melody where the angels hum the airs of immortal souls accompanied by a beautiful harmonica which pours its tears on the strings of an acoustic guitar or of a celestial harp. It's the very beautiful track which doubtless inspired Raphael's dreams in his series of Music To Disappear In albums. "January ' 89" offers a structure of rhythm as lively as the steps of a wolf which runs stealthily to hide. The tempo is rather difficult to describe with its jerks of percussions and bass pulsations which forge a strange spasmodic electronic march. Sequences and keyboard chords freeze an harmonious structure which rings like a melody hammered on a glass tube. "Song for Tricia" is a nice synth pop ballad with a catchy structure raised up on good percussions, of which some take the shape of tones of clogs on street bricks. 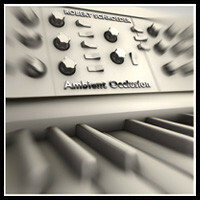 The synth is in panpipes mode and walks with harmony on beautiful layers with orchestral perfumes. Cute, it's a superb and lively melody. And we listen to it the hair which fight with the wind in a convertible car. "Abintra (A love Song)" goes beyond the limits of "Romance". It's a good ambient ballad where an acoustic six-strings roams on the harmonious jumps of the bass pulsations. A Mediterranean ballad! We also find perfumes of "Romance" in "Seashores". We are in the very poetic section of "Reflections" with this long meditative title of which the reflections scold in the background and serve as pattern to a shower of notes and chords which evaporate into suave orchestral arrangements and the soft caresses of sea broth which lead us to the quiet title-track. A title so quiet which offers a ghost lullaby and which reminds to us that David Wright has always liked flirting with the New Age. This reedition proposes 3 bonus tracks. Written in 2015 "Song for Life" goes with wonder with the dance of froth and completes amazingly this distant melody on "Reflections". The rhythm rocks a delicate ambient ballad with a solitary guitar and a piano which scatters a melody, rather catchy should I add, in this thick cloud of seraphic voices which also decorated the meditative delights of "Romance". It's a beautiful and very relaxing track. "Arela" is also a nice lullaby with chords which sparkle and swirl on a base of rhythm in the shape of a spatial trot. It's like a carousel where the brilliance of the arpeggios forges a good melody as catchy as that of "Song for Life" which was written 14 years later. 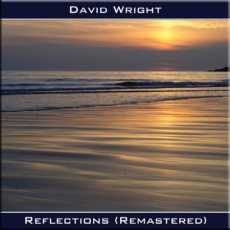 Written at the same time as “Reflections”, "Another Life" respects the serenity of this David Wright's very first album with a soft and meditative music where blows a solitary saxophone on the curves of the harmoniously ambient winds of violins. One should not let be blinded by the interest shown by Klaus D. Mueller to acquire “Reflections” because we are far from Berlin School here. Except that the arrangements and the very melodic approach of David Wright owed unmistakably a second breath to EM of the time. There is small jewels of tenderness on this album, as well as beautiful delicate and lively ballads. In brief, it's the perfect balance between the styles of that time. And in its envelope completely revamped, “Reflections” stays a beautiful very melodious album which has suffer a little of the weight of the years. And the authenticity of the sound here is a brilliant decision from David Wright. The music keeps its essence and its cachet of the 80's. And the bonus tracks add some more weight to this opus which is totally just like his impressive career. Of beautiful music! We like or not Robert Schroeder! We cannot be between both because his universe is very stylized and sometimes rather difficult to tame, so much the quest for sounds is the essence which gives the go to write music. And “Ambient Occlusion” is no exception. A little more experimental at the level of sounds, but not too much to bother whoever it is, than Dream Access, this last album of Aachen's magician offers another panoply of the styles which marked out his music since his comeback in 2005, but in a sound envelope always so spicy. Always in search of renewal. And we get this as soon as the first ambiospherical movements of "Palpitation". Arpeggios roam weakly in luxuriant layers from synths which multiply their effects and their colors between those of the cerebral sedation and the hearing curiosity. The turbulence of sounds explodes by fragments, surprising and fooling the senses. And as Schroeder's usual signature, fragments of melodies get loose from the atmospheres to roam as these unfinished rhythms which arise from psychedeli-cosmic ambiences of who we owe the wonderful Paradise and Harmonic Ascendant. And moreover it is a little bit at that era that Robert Schroeder leads us with "Gravity" and his introduction filled with dialogues extraterrestrial. The echoes of the knockings of the machines spread an effect of a reverberating rhythm behind a heavy electronic curtain. The main structure of rhythm is sat on a game of percussions to tones as ill-assorted as the convoluted pace. The synth is not outdone and shapes some sweet floating harmonies which crawl such as vampiric shadows on this structure which dives, for a short moment, in a nice multi-sonic immersion. It's the very first favorite of “Ambient Occlusion”. "Rigid Body World" is a little bit in the same style, but with more melodious elements. A wonderful sound brook makes wave and sparkle its prisms made of beautiful crystal clear sequences. Perturbed by brief explosions and caressed by the airs of a lunar saxophone, this structure of rhythm, more seraphic than lively, gets loose to undulate in solo or teams up with quicker elements to swing between an ambient phase and in an up-tempo filled of ambiences as so charming than striking. The title-track is the 2nd pinching to the soul. A delicious line of bass sets up a soft structure which winds a wall of sound elements of all kind. We are in the jungle, as in the cosmos. Knockings and sequences crumble shadows and percussive effects in what looks like these old soft and lascivious rocks of the 70's. Little by little "Ambient Occlusion" gets loose from its intro deliciously borrowed to this psychedelic rock of that era in order to sneak in a phase of cosmic Groove which is haloed of glaucous voices effects and by beautiful effects of the analog years. Decorated with similar elements, but less psychotronic, "Motion Blur" offers a fluid nice Chill Out with a good play of bass sequences and of sober percussions. With its thick cloud of melodious stars, its cosmic effects, its astral choirs and its solos forged of organic elements, the synth has the look of an intergalactic beast. Smooth and aerial! "Operating Systems" is a long title which crumbles its fragments of rhythms in a universe of sound experimentation with atmospheres which flirt between a very floating Berlin School and an anesthetic Chill Out. Here, the ears dominate the senses! "Live in Harmony" is my best moment in “Ambient Occlusion”. A kind of title which comes from nowhere with a livened up, a little bit jerky, rhythm built around a great movement of sequences which broaden their stroboscopic luminosities and the percussions borrowed from the hymns of Chill Out dances. OK, the voices articulated roughly can disturb! But the effect of light dance which the rhythm offers, the musicality and the contrasting harmonies of this structure of rhythm reaches an inconceivable symbiosis. Then imagine with the effects, the implosions a bit dramatic and the cosmic layers ... A delight! After a "Meditation" which has exactly the texture of its naming, but in a sound universe always so sought, "Something Happened" ends “Ambient Occlusion” with a structure of up-tempo slowly anesthetized by lush layers and effects of voices in a sound dimension multiplied tenfold by this desire to go farther and even farther from Robert Schroeder. Another very good album! Robert Schroeder's universe is in constant effervescent and the artist of Aachen has never made and still makes no compromise. He had destabilized a little his fans in the middle of the 80's by giving more rhythms to his music. In 1994, the synthesist and the engineer in sound took a break of more than 10 years. He will make his comeback on the Spheric Music label in 2005 with the album Brain Chips. Ten years later and 20 albums farther on the label of Lambert Ringlage, Robert Schroeder shows the same constancy; destabilize, surprise and always seduce his admirers. And it no matter the faces that he gives to his music. In two albums a year, our friend Robert has all the latitude to exploit his diverse musical avenues. In an artwork which gets near in all subtlety to the one of BackSpace, “Dream Access” is the Ying of this Yang. The title-track opens with an increasing synth wave which spills a sound arsenal filled of woosh, of cracklings and of effects of reverberations. We hear a voice? Possible. Everything is possible in the sound world of Robert Schroeder! This wave metamorphoses into a soft ethereal braid where stroll these chords so unique to the musician of Aachen and which chirp like electronic birds. But they are not the only chords. Under a synth wrap of the 70's is born a fauna of chords in tones as much contrasting than musical, of whom a series of bass pulsations. It's from this rather discreet line that takes shape the rhythmic structure of "Dream Access". Soft, it progresses as those of the analog time before merging in a more livened up structure where whistle and glide these soft solos with this so unique tone of Schroeder. And as the latter often likes to change of direction, this brief period of rhythm takes refuge with a rich ambiosonic phase which leads us in "Space Port" and its strange electronic clogs which click through a thick curtain of rain. These clogs get transformed into a structure of rhythm full of holes. It 's rather the line of bass, and its ample lascivious loops, which feeds the pace while the synth, and its trumpeter's flavors of Jazz, throws filets of very nostalgic harmonies which mate to layers of voice with grave and evasive tones. Slivers of percussions are banging a structure which little by little fits its pace on a line of sequences and its keys to the divided colors which rise and fall in symbiosis with the line of bass and these clogs which click such as steps lost in a narrow cosmic corridor. It's a good structure of rhythm built with intelligence which will crumble its last effects in a long finale of 3 minutes filled of ambiosonic smoke. "Brain Drain" respects this posology of introduction of atmospheres which decks out the majority of the titles of the Schroeder catalog. It's there that Robert Schroeder is the most creative. A kind of continuous panting forces a sweet and slightly jerky rhythmic membrane which hiccups under the effects of a thick magma of sounds and mist filled with tonal particles. Arpeggios and ringings force a kind of fusion between Groove and ambient Chill Out which remains buried under a wide foggy moor. This is very contemporary Schroeder! All the opposite with the very good "Imagination" and its structure of rhythm where various elements skip in symbiosis with the harmonies. The effect of feminine voice, the wide foggy layers and these soft synth solos bring us back to the era of Die Story der Final Legacy and Space Detective. If your ears are in search of a sound aestheticism as original as audacious, they are at the good address with the music of the German magician. With his slow intro filled of reverberant effects, of incisive blades, of bipolar woosh, of cosmic layers and of effects of static percussions "Friction of Time" will be the first title to really stuff them; from the auricle to the hearing nerve. It's more than 105 seconds to explore the sound vastness of the master of the tones from Aachen. If the slow cosmic layers inhale the charms of meditation, the bangings of electronic clogs (one would say a new concept of sequences here) pull kicks towards a good up-tempo trapped in very good solos from a very harmonious synth. And when the atmospheres turn into cosmic phases, the solos glide and the sequences wriggle like mechanical dentures in the woosh of long layers of a synth flavored of former incense. The 2nd part offers more lustre with voices of the cosmos which remind the IC years on a structure of rhythm which is very near the cosmic glitter rock of the 90's. "Solar Streams" is another wonderful title, my preferred one, with a structure of ambient rhythm which limps in a ton of analog fragrances and synth layers which throws so many effects as well as very good solos. We are in the old Schroeder of the Floating Music years here. Splendid! And Robert Schroeder continues to play with the tunings of the time. Of his time with this brochette of titles which revisisits his best elements, all decades included. "Time Axis" is near the music of dance, but rest anchored in these recipe of the 90's when Schroeder was tergiversating over his orientation. The rhythm is steady and rests on sober percussions while the sequences are attacking it from all sides, creating a mishmash kind of rhythmic pattern which will always stays on the edge of ebullition and whereas the synths multiply effects and harmonies in a vision which always pushes back the limits of the creation of sounds. "Floating in Dreams" ends this 34th sonic adventure of Robert Schroeder with a semi-soft structure. A down-tempo which goes up and goes down according to the rollings of the percussions and of the sequences, forging a lascivious dance which spins lightly beneath the stars where cosmic voices and seraphic layers caress a very beautiful ambient melody and charm our senses. 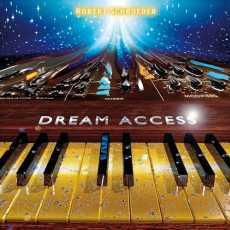 “Dream Access” is indisputably one of the best albums that Robert Schroeder has realized for a long time. The album has no faults and transports its 8 titles as well as its 58 minutes in a sound universe always in search of renewal. All the ingredients of an EM of the Berlin School style (woosh, slow and idle floating layers, effect of reverberations, cosmic effects, luxurious solos, sequencing pattern and all and all) are dressing the different colors which get harmonize marvellously with the constant exploration of the sounds machines that Robert Schroeder likes to reinvent. If the hymns of dance are always present, they are charmingly tempered by a keyboard always so harmonious, by percussions which always remain so stuck on ambivalent structures and by a brilliant game of the sequences which is absolutely essential to hear. “Dream Access” is solid and strong Robert Schroeder!